“When you hit a certain critical mass of duct tape, nothing can go wrong,” said Dr. Tony Phillips as he fiddled with a K-Mart lunch box cooler, fitting it with the radiation and temperature sensors that would soon be sent to the edge of space to take first-of-their-kind measurements during the August 21 total solar eclipse. As Phillips tinkered, he was surrounded by a gaggle of young, mostly tattooed, excited students from the Eastern Sierra who were busying themselves gluing crystals to platforms in front of GoPro cameras, attaching pendants and a stuffed astronaut Snoopy to rigs build specially for flying to the edge of space. The group, dubbed Earth to Sky Calculus, was started by Phillips as a way to teach his then-10-year-old daughter Amelia quantum mechanics. Yes, you heard that right. “Anna, say something that will convince this reporter that you remember something about quantum mechanics,” said Phillips to Anna Herbst, 21, daughter of Phillips’ wife, Katharine Allen. Herbst was one of the original members of Earth to Sky and Amelia’s childhood best friend. “The Schwarzschild radius is the point of no return,” said Herbst, referencing the German physicist Karl Schwarzschild, who proposed that radius as the ultimate boundary—how far something can be compressed by gravity before a black hole is created. Phillips, 53, smiled and nodded. He has a soft-spoken manner and demurs when asked about his credentials (“I went to Valparaiso Elementary School in Florida,” he said, when asked where he went to school. He actually graduated from Cornell University, which kind of had to be dragged out of him after I mentioned that he must be a self-taught astrophysicist). Phillips runs a website called spaceweather.com, where he covers all kinds of “space nerd stuff,” and which allows him to live in the community of Aspendell and donate his time to teaching kids quantum mechanics and how to launch stratospheric helium balloons into the atmosphere, which is what we were doing on Monday, August 21 during the first total solar eclipse to cross the United States since 1918. John Day was directly on the center line of the “path of totality,” or the line across the U.S. that the total eclipse passed through. 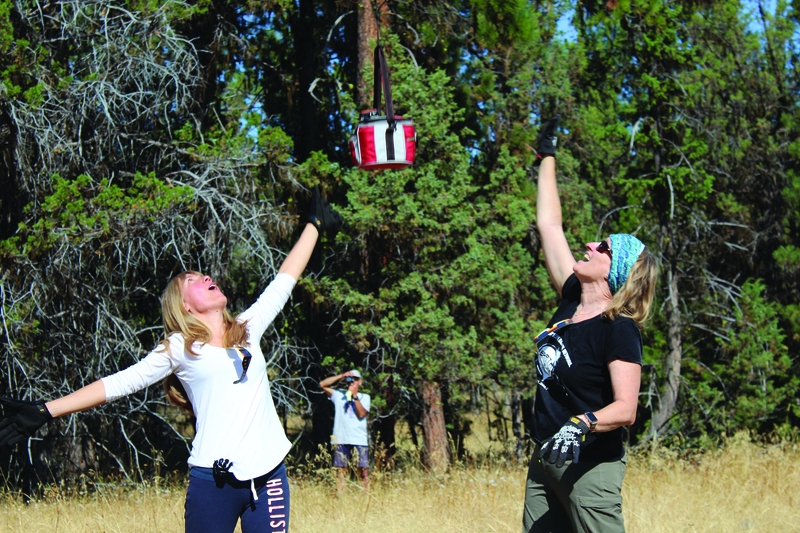 Phillips and members of Earth to Sky had fanned out to span the western half of the path—across Oregon, Idaho, Wyoming, Kansas and Illinois—to launch a dozen of their stratospheric helium balloons which would take photos, video and scientific measurements of the eclipse as it passed over the country. Many of those measurements, which have yet to be reported as of press time, are the first of their kind to ever be recorded. They’d been planning it for years, with a dry run in Indonesia in 2016 (see “Earth to Sky Students Take off for Indonesia,” March 4, 2016).